The human body has a response to stress (also known as the “stress response”) termed “fight or flight” which the body uses to confront or avoid danger. The stress response helps us meet challenges. The trouble we face with the stress response though is when it is provoked constantly by less serious daily issues like: job worries, relationship problems, money woes, and traffic jams. One of the results of this are health problems. One of the biggest examples is high blood pressure, which is a major risk factors for heart disease. Not only can a buildup of stress contribute to depression and anxiety, it also suppresses our immune system, increasing the chances of getting colds and other illnesses. Stress is unavoidable, nor would we want to avoid all stress. What we can do, and what we should do is develop better ways to respond to such stressors. One method is to use the relaxation response. Through a technique developed by a cardiologist by the name of Dr. H. Benson at the Harvard Medical School in the 1970’s. The relaxation response is a deep state of rest brought on in many ways such as (but not limited to): meditation, progressive muscle relaxation, and yoga. Breath focus, is a common feature of many techniques used to elicit the relaxation response. The first step is learning to breathe deeply. 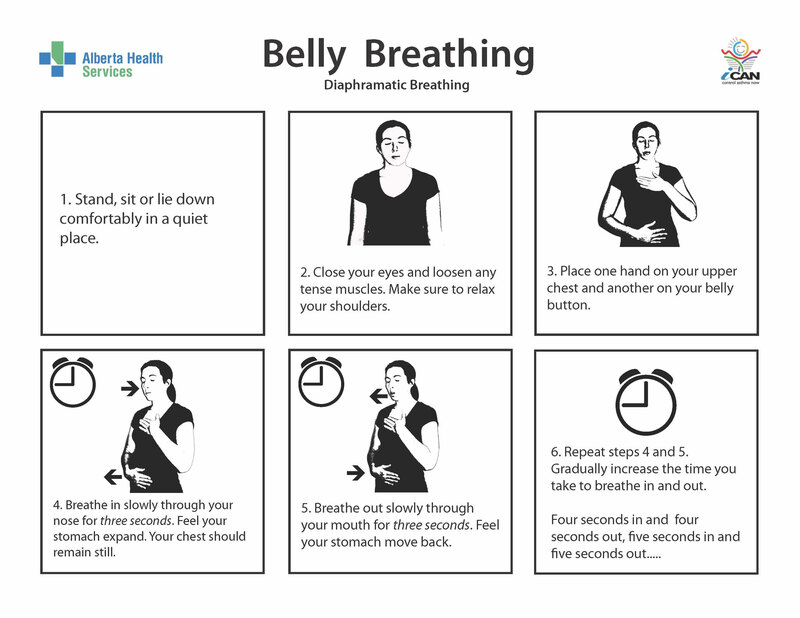 Deep breathing has many names: diaphragmatic breathing, paced respiration’s, belly breathing, and abdominal breathing. When you breath deeply, you breath in through your nose, fully expand your lungs, and rise your lower belly. This may seem unnatural to some, and there could be several possible reasons for this. Body image: A flat stomach is considered attractive, so men and women tend to hold their stomach muscles in which in turn gradually makes shallow chest breathing seem normal, which increases tension and anxiety. Shallow breathing also limits the range of motion of ones diaphragm, leading to the lowest part of our lungs not getting all oxygenated air possible, which could lead to making you feel short of breath and anxious. Belly breathing promotes a good exchange of oxygen for carbon dioxide, and in fact it can slow the heartbeat and lower or stabilize ones blood pressure. Breath focus helps you disengage from distracting thoughts and sensations by focusing on slow and deep breathing. Find a place to sit or lie down that is quiet. Take a normal breath, and then attempt to take a deep breath: slowly breathing through your nose allowing your lungs to fill and your chest and lower stomach to rise. Let your abdomen expand completely. Then breath out through your mouth or nose slowly (whatever feels more natural to you). Once you are use to deep breathing, you can move on to practicing breath focus regularly. Sitting comfortably, with your eyes closed and practicing deep breathing, try to think of helpful imagery and focus on words or phrases that will help you gain a deeper level of relaxation. Try several relaxation techniques, to see which ones work best for you. If one fails you, you will be able to use alternate techniques. Don’t try too hard, that will only be counter productive. Find a special place you can go to sit or lie down comfortably and quietly. Be somewhat active in eliciting the relaxation response, as the key to it is shifting your focus from stressors to deeper calmer rhythms. Try to take 10-20 minutes a day to practice.